If your mortgage is underwater — you owe more on your mortgage than your property is worth — you now have more time to refinance into a better home loan. The government’s Home Affordable Refinancing Program, HARP, has been extended until December 2018. The program was supposed to end this year. What is HARP (in case you’ve been living under a rock)? If Fannie Mae or Freddie Mac own your mortgage, and your loan is underwater, you can probably improve your situation by refinancing. HARP lets you refinance no matter how far underwater you are. According to the Federal Housing Finance Agency (FHFA), over 143,000 homeowners could still benefit from a HARP refi. HARP has been around since 2009, but has changed several times during its life. In HARP’s early days, homeowners and mortgage lenders struggled to make sense of the program. Many times, lenders would not approve borrowers who actually did qualify. Other applicants did not qualify a few years ago because they were further underwater than lenders wanted to finance. They might have been denied because they missed a recent mortgage payment. Or they had mortgage insurance. Or their current loan servicer did not participate in the program. It doesn’t matter. You can go to any lender, so you are not stuck with your current mortgage servicer or your current mortgage insurer. Make your mortgage payments on time for the next six to 12 months, then shop for a lender that will close your loan. Here’s all you need to be eligible for HARP. Freddie Mac or Fannie Mae must own your loan. Your loan must have been originated before June 1, 2009. If you don’t meet these criteria, do not despair. Check your credit history. Pay your loan on time until you have no mortgage late payments in the last six months, and no more than one in the last year. And check your property value, because there may be more equity than you think. You might be annoyed by HARP ads when you have been turned down and know you can’t take advantage of the program. But by now, you might not even need the program! 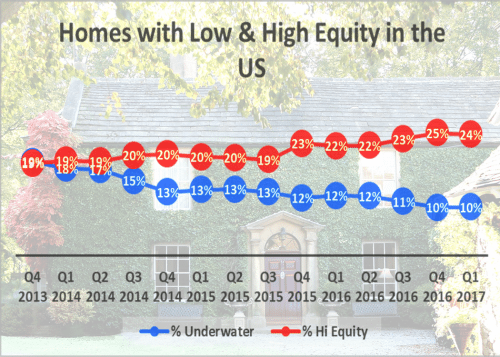 Home equity is growing as home prices rise across the US, according to ATTOM Data Solutions, a multi-sourced property database. The company reported that only about 5.4 million U.S. properties are still “seriously” underwater, with mortgage balances at least 25 percent higher than the property’s market value. This is down 64,000 from the previous quarter and 1.2 million from last year. In addition, ATTOM found more than 14 million equity-rich properties — those with mortgages totalling no more than 50 percent of the property value. So check your estimated property value. If it’s more than your loan balance, you may be able to refinance without jumping through HARP hoops. If you are not eligible for HARP, you may qualify for another program. All government-backed loans, for example, have streamlined versions of their ordinary refinances. Streamlined loans don’t consider your property value, so you can refinance while being underwater. Fannie Mae will also release a new program, sort of like HARP, but without the June 2009 cutoff. That plan is the “High LTV Refi Option” and it will be available in October 2017. Today’s mortgage rates are at their lowest in many months. Without all the competition that has come with rate dips in the past, you may have an easier time refinancing now than you would have in the past.